Barabati-Cuttack MLA Debashish Samantaray tendered his apology after a video of the incident went viral on the social media. Cuttack BJD MLA Debashish Samantaray. 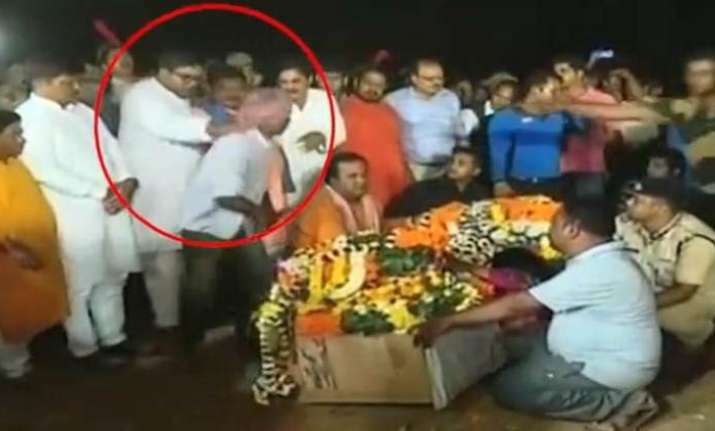 A BJD MLA allegedly manhandled a relative of slain CRPF jawan Manoj Kumar Behera during his funeral and apologised for his action on Tuesday. The video shows Samantaray pushing the uncle of Behera, who was killed in the Pulwama terror attack. The relative of the slain jawan is seen falling down near the coffin, when Behera was being paid homage before his mortal remains were consigned to flames in his native village of Ratanpur in Cuttack district on February 16. On Tuesday, Samantaray apologised for the act and said it was committed without "any intention". "I tender my apology for the act which was committed without any intention. There was a huge rush near the cremation ground and I had gone to maintain discipline," he told reporters. The incident that took place in the presence of Odisha Health Minister Pratap Jena and two other ruling Biju Janata Dal (BJD) MLAs sparked a strong reaction across the state and the opposition Congress and BJP demanded action against Samantaray. The BJP staged protests at the Niali Bazar area in Cuttack district on Monday against the MLA. "We demand strong action against the MLA, who manhandled the relative of a martyr. Chief Minister Naveen Patnaik must intervene in the matter," Congress leader Mohammed Moquim said. The BJD has appealed to all not to politicise the incident. The last rites of the two CRPF jawans from the state who were killed in the February 14 Pulwama terror attack -- Manoj Kumar Behera and Prasanna Kumar Sahu -- were performed at their respective villages of Ratanpur in Cuttack and Shikhar in Jagatsinghpur districts on February 16.